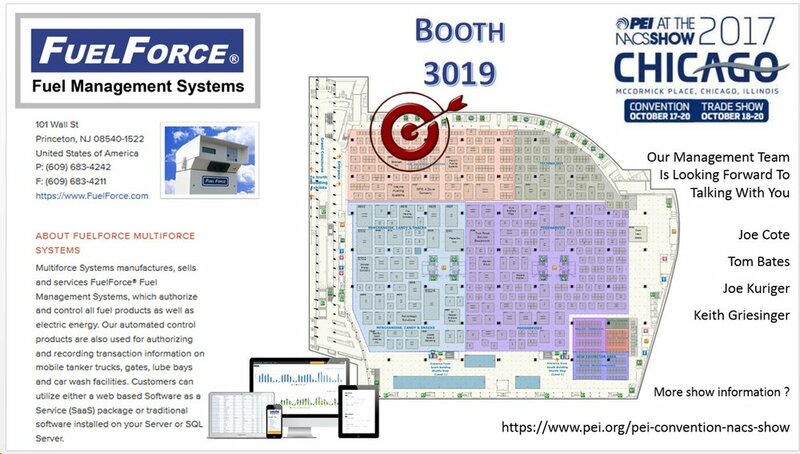 Come join Multiforce Systems at the NACS PEI show located in Chicago October 18 - 20. Visit us at Booth 3019 in the South Hall. Come join Multiforce Systems at the CONEXPO located at the Las Vegas Convention Center March 7- 11. Visit us at Booth S60902 in South Hall 1. Refer to the map below. This trade show and exposition will feature the latest in retail and petroleum technology. You can locate Multiforce Systems at Booth #2020 to discuss your fuel management solution. Our durable, long lasting system will maintain, control and secure your fuel site. Matched with our latest web based software, FuelForce has taken the reigns as a leader in the fuel management industry. With user friendly interfaces, users can now easily manage their fleet and fuel. Come join Multiforce Systems at the New Jersey League of Municipalities at the Atlantic City Convention Center in Atlantic City, New Jersey November 15-17. Show Hours are Tuesday from 9am-5pm, Wednesday from 8:30am-5:00pm, and Thursday from 8:30am-1pm. Come join Multiforce Systems at the PEI/NACS Show at the Georgia World Congress Center in Atlanta, Georgia October 19-21. Show Hours are Wednesday and Thursday from 11:30am-5:30pm and Friday from 9am-1:30pm.